Ten second-year Drama and Performance students have taken part in a physical theatre residency in the south of France with Obra Theatre Company. The London South Bank University (LSBU) students travelled to Au Brana, near Toulouse, and over five days created theatre with the company based in a converted set of farm buildings which functioned as a studio space to perform their work. Drama lecturer Dawn Ingleson said during the residency students explored Obra Theatre Company's way of theatre-making through 'embodied theatre’ and were encouraged to strip away the acting and get to grips with physical presence. “The workshop leaders and directors of Obra Theatre Company and Au Brana Cultural Centre were exceedingly happy with the results and kept saying how satisfying our students’ pieces were to watch,” she said. Following the residency, some students have decided to return to France this summer for a longer three-week programme. Student Jacob Walls said: “My time in Au Brana helped me gain a deeper understanding of the use of movement and physicality in certain types of performance. “Although the physical regime was ruthless, it showed the dedication and determination needed in order to succeed in this specific area of theatre. LSBU has developed a strong relationship with the company, as two graduates are now employed by Obra and have recently completed a three-month tour of their latest performance work. 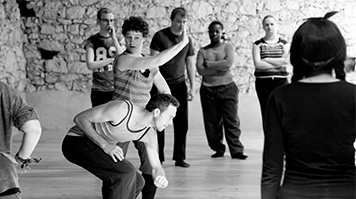 Learn more about Drama and Performance courses at LSBU.